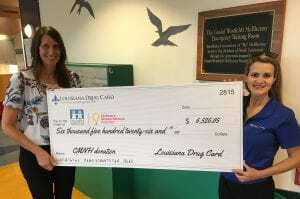 Louisiana Drug Card Raises more than $6,500 for #CHNOLA! Children’s Miracle Network Hospitals corporate partner, United Networks of America and Louisiana Drug Card raised $6,526.05 for Children’s Hospital. Representative, Jene Miller, presented Children’s Hospital with a check on July 12. Thanks United Networks of America for #MakingMiracles for the kids at CHNOLA!